Prompted by the occasion of the 45th Anniversary of Who’s Next I have been urged by those who run The Who’s Fan Page on Facebook to post the following track by track run down of the songs on the album from my book The Complete Guide to The Music of The Who, updated in 2004 with help from my pal and fellow Who Archivist Ed Hanel. This relates to the De Luxe edition, released in 2003, on which I’m credited as ‘Executive Producer’ because I played a part in selecting the bonus tracks, arranging the packaging and persuading Pete to write his liner notes. Most of what follows was written by me for the original 1995 edition of the book (Ed chipped in with info about the upgraded editions) and Who scholarship may have advanced in the succeeding 21 years, not least by Pete himself in his book Who I Am. The original Who’s Next consisted of nine tracks. All songs by Townshend unless otherwise noted. Thirty seconds of a spiralling loop, played on a Lowrey organ and fed through a synthesizer, opens the album with one of its most memorable tracks. ‘Baba’, of course, is Meher Baba, Pete’s spiritual pal, and O’Riley, is Terry Riley, the electronic composer whose work A Rainbow In Curved Air inspired Pete’s use of looping synthesizer riffs. Piano, voice, drums, bass and eventually guitar join in but it’s the cut and thrust between Daltrey’s leonine roar and Pete’s tuneful pleading that gives the song its tension and best moments, though the free-form climax, a souped-up Irish jig featuring Dave Arbus (of the group East Of Eden) on violin and Keith playing as fast as he’s ever played, is quite mesmerising. “Teenage Wasteland”, the starting point for Pete’s imaginary generation in their search to find nirvana, became a timeless Who entity in Roger’s hands, and the downright disgust at the way things had turned out (post-Woodstock) was never better expressed in rock. The synthesizer track that dominates ‘Baba O’Riley’ is part of a longer synthesizer piece that Pete released privately on a Meher Baba tribute LP I Am in 1972. Further sections featured on his Psychoderelict solo LP in 1993. Most songs addressed to ‘you’ are sentimental love songs but the you Pete addressed in ‘Bargain’ is his avatar, Meher Baba. ‘Bargain’, which stands alongside any of the best tracks on Who’s Next, is about the search for personal identity amid a sea of conformity, with lyrics such as “I know I’m worth nothing without you” giving the Baba slant away, especially when sung by Pete in a keening counterpoint to Roger’s harsher lines. Although there’s a low-key synthesizer track in the background, ‘Bargain’ shows off The Who’s ensemble playing at its very best. Block chords abound, there’s a terrific guitar solo, bass lines pop and crackle and Keith’s drumming gives the song a rhythmic foundation that lifts The Who clean out of your speaker cabinets. A terrific live version of ‘Bargain’ can be found on Who’s Missing (see below). John’s song of marital discontent gets many fans’ vote for the best he ever wrote for The Who and it provided the group with a terrific stage rocker, complete with the kind of block chords that Pete loved to play while spinning his arm windmill-style. Although this version is no slouch, John was dissatisfied with the sound and re-recorded it himself on his third solo album, Rigor Mortis Sets In (1973). On live versions, Pete would stretch out during the song’s solo and end, duelling with John to mesmerising effect. ‘My Wife’ is possibly the most ‘Who-like’ song John ever wrote, certainly the closest to Pete’s style of writing, and the lyrics, evidently about his first wife Alison, are generally hilarious. Among the most gorgeous ballads Pete has ever written, ‘The Song Is Over’ again highlights the contrasting vocals of Roger and Pete, as well as some inspired synthesizer work, tasteful piano playing by Nicky Hopkins, and a sumptuous production. Because of its complexity, it was never played live. Doubtless intended as the climax to Lifehouse, it features as a coda the motif from ‘Pure And Easy’ (see Odds & Sods below), another key Lifehouse song that was inexplicably left off the album. The closing passages are enhanced by an almost subliminal top-of-the-scale synthesizer harmonic line that traces the melody with a marvellous undulating counterpoint. It is only by listening to this song, in conjunction with others like ‘Pure And Easy’, ‘Baba O’Riley’, ‘Bargain’, ‘Time Is Passing’ (which The Who never released) and ‘Behind Blue Eyes’ that the real potential of Lifehouse, at least from a purely musical point of view, can be truly appreciated. A rock opera, or at least a song cycle, based around material as strong as this would surely have been the rock masterpiece to end all rock masterpieces. When it failed to materialise in the way he envisaged, Pete’s disillusionment led to his first nervous breakdown and almost broke up The Who. Using the time honoured tradition of tuning up before a show as an allegory for creating harmony between disparate societies, ‘Getting In Tune’ is another fearless rocker, perhaps not quite so breathtaking as others from the album, but certainly no slouch. Like ‘The Song Is Over’, this is a showcase for Roger at his absolute best. With its rolling, appropriately ‘mobile’ rhythm and absence of harsh chords, ‘Going Mobile’ lacks the grandeur of many of the other tracks on Who’s Next, but it’s a witty and worthy contender nevertheless, a ‘travelogue’ sung by Pete about the joys of driving around gypsy-style in his newly acquired holiday home. Lines about ‘hippy gypsies’ seem particularly apt in the modern era of New Age travellers. Apart from its tricky little acoustic rhythm signature, it’s also notable for the guitar solo in which Pete wired his electric through a device similar to a wah-wah called an ‘envelope follower’, with the result that it sounds like he’s playing underwater. Opening with one of the prettiest melodies Pete has ever written, ‘Behind Blue Eyes’ rightly became a Who classic almost immediately. Crystal clear acoustic guitar, Roger at his melodic best and a fluid bass line take the first verse, velvet three-part harmonies join in for the second, then, finally, in lurches Keith to give ‘Behind Blue Eyes’ its third and final dimension. The faster central passage, a plea to the creator for confidence and succour, contains the most moving lyrics on the whole album, before the song reverts back to its gentle opening lines at the close. The choir-like closing vocal harmony, drenched in reverb, is deliberately – and brilliantly – sequenced to contrast sharply with the shrill electronic synthesizer riff that heralds ‘Won’t Get Fooled Again’. If there is a key song on Who’s Next, it is this lengthy call to arms that became the traditional show closer at Who concerts from this point onwards. Based on a clattering synthesizer riff that locks the group into a tight, rhythmic performance, ‘Won’t Get Fooled Again’ is classic mid-period Who at their very best, Pete’s block chords firmly in place, John swooping up and down his bass, Roger singing his heart out and Keith an almighty presence, albeit slightly more disciplined than usual in view of the song’s inflexible structure. With lyrics that address the futility of revolution when the conqueror is likely to become as corrupt as the conquered, the song inspired many a clenched fist, especially when Roger came careering in at the end of the lengthy instrumental passage, declaiming the ‘bosses’ and inciting the kind of scenes that left the Bastille in ruins. His scream before the final verse is one of the most volatile vocal eruptions ever recorded. Edited down from its original eight minutes and thirty seconds, ‘Won’t Get Fooled Again’ as a single reached Number 9 in the UK charts and 10 in the US. This is the original version of ‘Pure And Easy’ recorded at the Record Plant, New York, on March 17-18, 1971. A later version was recorded at Olympic Studios, London, but not released until the Odds & Sods LP in 1974 (although, confusingly, John Entwistle recollected the recording stemmed from the preparatory sessions made at Mick Jagger’s mansion, Stargroves on the Rolling Stones Mobile). A key song from Lifehouse, ‘Pure And Easy’ is a beautiful Townshend composition that should have appeared on Who’s Next but was left off, probably because The Who weren’t 100% satisfied with the versions they’d recorded during the Lifehouse/Who’s Next sessions. It is hard to find anything wrong with the version included here. ‘Pure And Easy’ is Pete’s re-write on the myth of the ‘Lost Chord’, a deeply felt song about the ultimate musical note, the loss of which symbolises mankind’s decaying relationship with the universe. It is a song of yearning, almost a tearful lament, albeit fashioned over Who-style torrents. The guitar solo builds to a tremendous climax, rather like Jimmy Page’s memorable solo in ‘Stairway To Heaven’. Pete thought very highly of ‘Pure And Easy’ when he wrote it - so much so that its chorus forms a coda to ‘The Song Is Over’ on Who’s Next, and he included it in demo form on his first solo album Who Came First. It’s remarkable to think that at this stage in his evolution as a songwriter (1971) Pete Townshend was able to discard material as strong as this. The Who performed ‘Pure And Easy’ on stage briefly during 1971, on stage at the Young Vic and occasionally thereafter. A stage favourite of The Who’s from the 1964-66 era, this Marvin Gaye Motown classic was perhaps an unusual choice for revival for Lifehouse. Played at the Young Vic and in the concert act for the remainder of 1971, this version was recorded at the Record Plant, New York on March 16, 1971. Leslie West guested on lead guitar. This was recorded live at The Young Vic on April 26, 1971, and first released as part of the 1994 30 Years of Maximum R&B box set. A studio version, recorded at Pete’s Eel Pie Studio in 1970 appeared on the Odds & Sods LP in 1974. A superb stage song, ‘Naked Eye’ was developed on stage as part of the improvisation during extended versions of ‘My Generation’ (see Live At Leeds) and, once fully formed, played at virtually every Who concert in the early Seventies. It took on enormous power as Pete and Roger shared verses that contained some of Pete’s most powerful lyrical imagery ever. 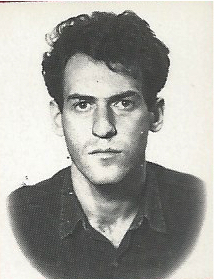 Between oblique references to drugs and guns is a deep sense of frustration and failure, of not knowing where next to run to, yet at the same time realising that to stand still is suicidal, matters uppermost in Pete’s mind as he sought to justify his continued role in The Who and The Who’s continued existence. Meanwhile the band strains at the leash, while a strange nagging riff holds the song together. This is the riff that made its first appearance at concerts during 1969 when the band were jamming at the climax to their shows, and only later did Pete add lyrics to harness it into ‘Naked Eye’. Like ‘Pure And Easy’, ‘Naked Eye’ is an essential Who song, far more important than many found elsewhere in the catalogue. Also recorded at the same Young Vic show as above. An overlong, rather heavy-handed rocker, ‘Water’ is another Lifehouse reject, this one mixing a rather lascivious hook line (‘water’ rhymes with ‘daughter’ throughout) into a song in which ‘water’ becomes an allegory for quenching spiritual thirst. Considering the role it played on stage, it seemed destined for inclusion on whatever album that would follow Tommy. Eventually Pete came up with several far better songs, and despite several stage comments at various shows and concerts during 1970/71 introducing it as a possible Who single, ‘Water’ was consigned to the scrap heap, only to resurface as the UK B-side of ‘5.15’in October 1973. Another Lifehouse outtake, produced by The Who, and associate producer Glyn Johns, at Olympic Studios, London, April 12, 1971. It was first released in 1974, with Roger’s re-recorded vocal, on Odds & Sods. ‘Too Much Of Anything’ is a rather pedestrian rock ballad, with Nicky Hopkins on piano, that deals with greed and its consequences, but the song meanders along indifferently without the punch of other Lifehouse tracks. The Who occasionally played it on stage in 1971 but soon dropped it. This is a 1970 Eel Pie recording that was part of a planned EP project. Instead, it appeared as the B-side to the ‘Won’t Get Fooled Again’ single in June 1971, credited as ‘Don’t Know Myself’. A Lifehouse reject which wasn’t quite up to the standard of the other songs Pete was writing in 1970, ‘I Don’t Know Even Know Myself’ blends a fierce verse and chorus with a strange, country and western style middle eight which features Keith tapping a wooden block. Often played live in 1970/71, but dropped when Who’s Next provided the band with better stage material. This original version of ‘Behind Blue Eyes’ was recorded at the Record Plant, New York, on March 17-18, 1971, and features Al Kooper on organ. Deluxe Edition (2003), also available on vinyl. The first CD contains the nine tracks off the original album and the following bonus tracks from the Record Plant Sessions, New York, March 1971. While the remixed and remastered CD featured a 5:13 edit with Keith’s barely audible comment, “put away your girlie magazines” at the start, the Deluxe Edition featured a new 8:20 remix of the complete version, with Roger’s barked “a bit of quiet please” command before starting and an outbreak of laughter when the track finally winds down. An alternative version from the Record Plant sessions, recorded March 18, 1971. Previously unreleased. This is the same take as on the remixed and remastered CD, except it has been freshly remixed and has a full ending instead of fading at 4:19. Originally produced by Kit Lambert, this version of ‘Love Ain’t For Keeping’ was recorded on March 17, 1971. It features a live vocal from Pete, and Leslie West on second guitar. 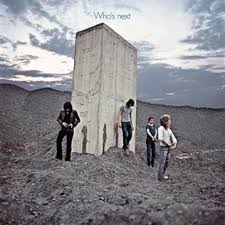 Previously available on the revamped Odds & Sods CD in 1998, the Who’s Next version was recorded with Glyn Johns at Olympic Studios in London two months later. This is the same track as on the remixed and remastered CD. This is an early version of the song from the Record Plant sessions, recorded on March 16, 1971, featuring a different synthesizer pattern than the released version, with the famous lyric “Meet the new boss, same as the old boss”, occurring before the final synthesizer break and drum pattern, and lacking Roger’s memorable scream. Pete had anticipated using live material from a number of small concerts before a specially invited audience to help develop the Lifehouse project. The Young Vic Theatre, a venue close to Waterloo Station with a reputation for the avant garde, was booked each Monday and the Rolling Stones Mobile was hired for what appears to have been the final Lifehouse show on April 26, 1971 (where the tracks on the second disc emanate from). Also recorded at this show but left off because of space restrictions were: ‘Baby Don’t You Do It’, ‘Pinball Wizard’, ‘See Me, Feel Me’, and ‘Boney Maronie’ (see 30 Years Of Maximum R&B). By all accounts, the Lifehouse experiment was physically and mentally frustrating for Pete, and the tapes were quietly shelved as he failed to bring the concept into a format his fellow band members and audience could understand. As informal an introduction a Who concert could ever produce, this was the electric version of ‘Love Ain’t For Keeping’ the Who used to open their UK and US concerts over the summer of 1971. Considering that this (and the majority of the Young Vic material) were working versions of what were then unreleased songs, The Who clearly show they were masters of their craft, if somewhat mystified at what Pete was trying to produce. Entwistle and Moon’s interlocking playing is particularly noteworthy. A very good version with Pete’s guitar solo not quite as developed as the recorded take, but with John’s trebly bass figures well to the fore. The additional verse from Pete’s demo (lopped off for the recorded version) is still intact. The transition to “There once was a note, Listen!” is well handled in the latter part of the performance with more fine Townshend soloing. The band begin aggressively enough, if not with quite the flair as at Live At Leeds, but Pete’s guitar goes dead at 1:40 (one can only imagine the stage demonstration in anger management that Pete is not exercising!). While his guitar gets seen to, Entwistle and Moon carry on a breathless display of interplaying for 30 seconds without the slightest need for a lead guitarist or vocalist. Pete kicks back in and vents his frustration in a great guitar run until he peels off into a very beautiful blues orientated solo. This version highlights the great mix on the Deluxe Edition’s second disc, best heard in the contrast between Pete’s and Roger’s vocals. ‘Time Is Passing’ was first widely heard on Townshend’s solo album Who Came First, which was released in September 1972. Originally recorded during the Olympic Who’s Next sessions, a remastered Who studio version from a damaged master tape was released on the upgraded edition of Odds & Sods in 1998. Introduced as “probably a single”, this live version is unusual in that Keith is still seated behind his drums during the opening verses (playing cymbal flourishes) when traditionally he was banished from the stage. He comes in on the beat with impeccable timing. Pete first rebukes a fan that dared to stand up and ‘idiot dance’ during the previous song. Pete explains that he normally wouldn’t care, but it is distracting as The Who are playing “a whole new show”. An excellent version as is to be expected for a song The Who had played live for the past year. Pete introduces the song by smoking a cigar to celebrate the recent birth of his second daughter, Aminta. When a heckler pipes up, Pete retorts with “because I’ve had more fucks than you’ve had mate… Many more… When you catch up, come round”. Although Roger starts off in a key that is comfortable for his range, as the song progresses, he strains to hit the high notes. A good attempt, nevertheless and fascinating to see what worked well on stage for the band while developing what came to be known as Who’s Next. This sounds faster than the album version, and lasts for over six and a half minutes. John’s bass line doesn’t sound fully developed yet, and at 4:10, the bass and guitar cut out as Roger, John and Pete repeatedly sing the pay-off line “Getting in tune to the straight and narrow”. Pete apologises that the new songs are “sounding a wee bit lame, but they’ll come together”. This version is played a little slower – the tempo throws Moon into some confusion - but is noteworthy primarily for the lack of synthesizer that dominates the album version. The song was refined and went on to be one of the exhilarating highlights of the Who’s 1971/72 shows (check out the live version on Who’s Missing and 30 Years Of Maximum R&B) for confirmation, so why it wasn’t retained in the act remains a mystery. In a live context, The Who often dragged this slight song out to an inordinate length – no exception here at 8:19 (this Young Vic version first appeared in edited form on 30 Years Of Maximum R&B and the remastered Who’s Next ). While it’s debatable whether it merited such an approach, it was a cornerstone of Who shows throughout 1970/71. A studio version eventually appeared on the B-side of ‘5.15’ in October 1973. Originally written and recorded by blues master Bo Diddley (a.k.a. Ellas McDaniel) in 1959, a song subsequently covered by many artists during the British R&B boom of the early to mid-Sixties, among them The Rolling Stones, The Animals, The Pretty Things, The Zombies and The Who. (In fact, it was this very song that the group played during Keith Moon’s drum-damaging audition at the Oldfield Hotel, Greenford, in April 1964.) During tours in the Seventies The Who often lurched into this medium paced rocker during lengthy jams within the ‘My Generation’ framework. Sharp-eared Who aficionados can pinpoint that this song (and certainly the middle break) had its genesis in parts of Pete’s guitar work played during the ‘My Generation’ finale of The Who’s set at Woodstock. A long-standing concert favourite, this version is slightly marred by Roger forgetting the lyrics during the final verse. A studio version was recorded at Eel Pie Sound in 1970 (completed at Olympic on June 7, 1971) and released in 1974 on Odds & Sods. The Who’s second epic single (after ‘I Can See For Miles’) was pretty well worked out at this stage (possibly because it had already been recorded). There are some interesting guitar runs played over the synthesizer, with Roger’s definitive rock and roll scream at the conclusion, but the recorded version has a little extra drive and aggression. Called upon to edit a book about the history of rock on television earlier this year, I was taken back into the world of Six-Five Special, Oh Boy! and Juke Box Jury. These names will ring a bell only to those of us who can remember a time when news presenters, all of them male, wore evening dress to inform us of the day’s events, when Woodbine cigarettes were available in packets of five and when Cliff Richard – believe it or not – was deemed threatening. These were not the only televised shows that featured what was termed ‘beat music’, just the best known, and the book I edited is not a nostalgia fest – it is bang up to date and dwells lovingly on Ready Steady Go! and The Tube, to name but two – but somehow I found myself drawn to the first chapter, about the fifties, for the simple reason that it was all so innocent then and, of course, this was the first rock’n’roll I ever saw, as opposed to heard. All of which explains why earlier today, browsing the CDs in Sainsburys, I was tempted by a CD package called Rock’n’Roll Britannia: The Foundations Of Rock’n’Roll Culture which looked like a snip at £3 for 75 tracks across three CDs. Leaving aside for a moment the undisputed truth that the foundations of rock’n’roll culture lie not in Blighty but somewhere south of the Mason Dixon line in America, this works out at just four pence a song so it’s unlikely Cliff, Marty, Adam, Billy, Tommy and all the rest will benefit much from my indulgence, a sad reflection on the value of music these days. It was misleadingly packaged with the kind of graphics that suggest it's a Britpop compilation – Noel Gallagher’s Union Jack guitar on the front – and it lacks sleeve notes of any kind bar a track listing, but in no other way do I regret my purchase. Prog rockers would be advised to note that no song exceeds two minutes and 48 seconds, with the shortest ‘Big Beat Boogie’ by Bert Weedon clocking in at just 38 seconds, shorter than any Ramones track on my iPod, as is the shortest vocal track, ‘What Do You Want’ by Adam Faith. The running time is two hours and 45 minutes, which means the average song length is two minutes and two seconds – and they say kids today have no attention spans. What these early British rockers lack in finesse they by and large make up for in enthusiasm, albeit often misplaced. Nevertheless, I may have been hasty in a previous post when I suggested that Cliff Richard’s debut single ‘Move It’ was the only decent record he ever made, for ‘Dynamite’ and ‘Livin’ Lovin’ Doll’ aren’t bad at all, and he makes a decent fist of ‘Twenty Flight Rock’ and ‘Blue Suede Shoes’ too. The rot set in with Lionel Bart’s ‘Living Doll’ which, doubtless because it was his first number one, set him on the path to righteousness and rubbish records. The same thing happened to Cliff’s role model Elvis, of course, insofar as the insipid movies GI Blues and Blue Hawaii were enormous hits, far more popular than his earlier films, and similarly nudged him down the slippery slope to inconsequence. Tommy Steele was another victim of the dreaded ‘family entertainer ambition’ syndrome. I can remember my mum taking me to the local Odeon in 1957 to see the movie The Tommy Steele Story, a sort of bio-pic that dramatised his rise from ship’s steward to Britain’s ‘first rock’n’roll star’, but of his four tracks only ‘Tallahasie Lassie’ is worth a second listen. I can only hope he listens to Paul Weller’s ‘Come On Let’s Go’ to learn what a song with this title ought to sound like. The omission of Johnny Kidd & The Pirates’ ‘Shakin’ All Over’ is strange considering that two other great JK&TP’s tracks, ‘Feeling’’ and ‘Please Don’t Touch’, are included, but I suppose this has something to do with availability. A third JK&TP’s track, ‘If You Were The Only Girl In The World’, is an uncharacteristically bad choice on their part. Quite why they were persuaded to record an inappropriate marshmallow ballad written in 1916 is a mystery to me. Aching melodrama was clearly a sought after ingredient in fifties pop ballads that dealt with unrequited love and in this respect Marty Wilde (‘Endless Sleep’), Billy Fury (‘Maybe Tomorrow’) and Vince Eager (‘This Should Go On Forever’) all score heavily. It’s not hard to imagine teenage girls weeping buckets and wringing their hands in anguish as these heart-throbs, their voices drenched in doom-laden echo, emote raw feelings of discontent at the faithlessness of their women. Better Fury tracks of which I am familiar are not included. Men dominate, of course, but the two tracks by girls stand out. ‘A Girl Likes’, a rockin’ 12-bar by Janis Peters, shows the clear influence of Brenda Lee and could easily be mistaken for a Lene Lovich B-side. ‘Getting Ready For Freddy’, on the other hand, is a novelty song by variety star Alma Cogan, the most successful UK female star of the fifties, whose curiously dark life was the subject of a brilliant novel by Gordon Burn. There are, of course, far too many tracks by relative unknowns for me to asses the lot here but it’s worth mentioning that Dickie Pride doesn’t quite make the grade on ‘Slippin’ And Slidin’’ but the guitar solo is ace; Larry Page, who went on to manage The Kinks, can’t rock for toffee if ‘Cool Shake’ is anything to go by; Vince Taylor’s ‘Brand New Cadillac’ is more than respectable; ‘Six-Five Special’ by Don Lang & His Frantic Five, which became the theme tune to the TV show, is marred by Lang’s assumption that the faster you play the more you rock; and ‘Rockin’’ by Tommy Sampson & His Strongman sounds like the Black & White Minstrels have washed off their dodgy black make-up and ill-advisedly pitched into this newfangled rock and roll business, ditto The Most Brothers who cover ‘Whole Lotta Woman’, a song originally recorded by Cherokee Indian Marvin Rainwater that I remember my mum buying for her pop mad 11-year-old son, on the yellow MGM label, in 1958. Finally, there are Beatles fingerprints to be found on this set. Of songs they recorded, we have Terry Waye doing ‘Matchbox’ and Jack Parnell doing ‘Kansas City’; and of songs they covered we have Craig Douglas’ curiously anaemic reading of ‘Nothin’ Shakin’ (But The Leaves On The Trees)’ and ‘Whole Lotta Shakin’’ by The Tunettes (who they?). Roy Young, who played with the Fabs on stage in Hamburg, rocks out splendidly on ‘Big Fat Mama’, and ‘Raunchy’, the guitar instrumental that secured George’s future after he played it to impress John atop a Liverpool Corporation bus in January 1958, is offered up by the bandleader Ken Mackintosh. "Hi there... we've got almost a hundred cats jumping here, some real cool characters to give us the gas, so just get with it and have yourself a ball," spluttered DJ Pete Murray when Six Five Special first went on air on February 16, 1957, a priceless quote from the rock on TV book. We Hope You Have Enjoyed The Show: The Story of Rock and Pop on British Television by Jeff Evans, to be published by Omnibus Press on September 12. 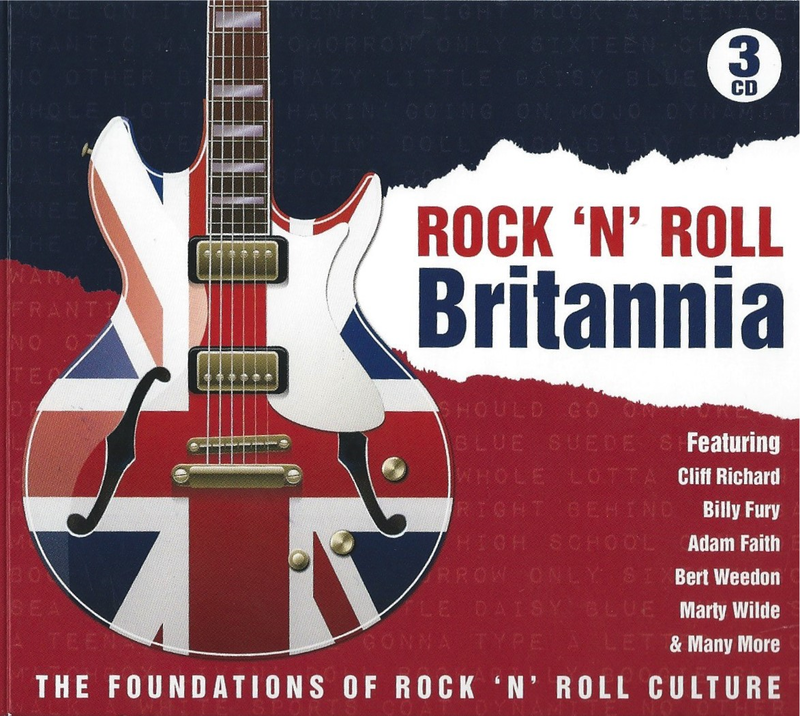 In the fifties it would probably have been regarded as treason to use Union Jack imagery to promote rock’n’roll. Townshend changed all that. For reasons that I am at a loss to explain Just Backdated has seen a surge of hits from Russia in the past month, over 10,000 compared with 2,886 from the USA and 1,302 from the UK. Russia has now leapt into third place after the USA and the UK in terms of all-time national visits, overtaking Canada, Germany, France, Japan and Australia in a matter of weeks, and although it still has some way to go to challenge the US and the UK in all time hits totals, if they keep up this pace it won’t be long before that challenge becomes serious. As I say, I haven’t the foggiest idea why music fans in Russia have suddenly cottoned on to Just Backdated in the past few weeks, but I welcome them all the same. If any of them are reading this, maybe some could enlighten me. Has JB been promoted by some Russian music forum that I don’t know about? Has a link to JB been shared by some influential Russian rock critic? Has JB been mentioned on a Moscow radio rock show? Please tell me. In keeping with the Russian theme, it may be of interest to these new readers to learn that I have some previous in regard to Russia and rock music. 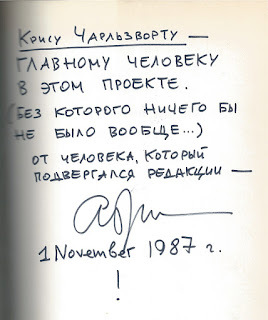 In 1986, on behalf of Omnibus Press, I commissioned the noted Russian music critic Artemy Troitsky to write Back In The USSR: The True Story of Rock in Russia, an account of the history and development of rock music over the previous 25 years in what was then the Soviet Union. As I wrote in a brief note at the beginning of the book, I got the idea for this project when I read a Guardian article about Russian rock that was written by Artemy and commissioned by the paper’s then Moscow correspondent Martin Walker. This wasn’t as easy it sounds. Back then Soviet chief Mikhail Gorbachev had yet to initiate glasnost and perestroika, so the USSR was effectively still a closed shop. Artemy wasn’t supposed to accept a commission from a western publisher and all manuscripts by Russian authors intended for publication outside its borders were supposed to be delivered via VAAP, the Russian copyright agency, which would translate it from Russian to English and, presumably, censor it while doing so. We got around this by having Artemy write two manuscripts, one for them and one for Omnibus, ours being smuggled out via the Guardian’s diplomatic bag courtesy of Martin Walker. 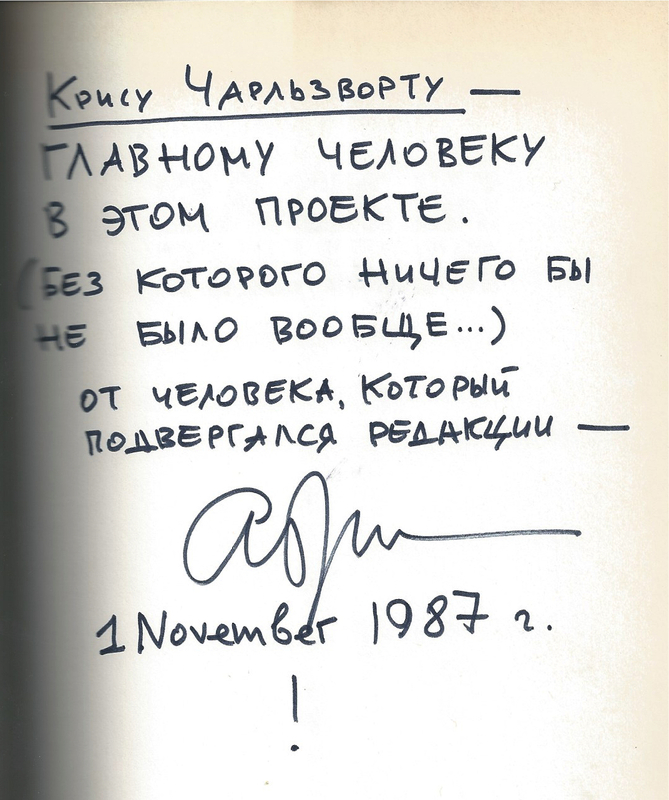 Not having access to an English-alphabet typewriter, Artemy painstakingly wrote it out in his best English in longhand, meaning I had to type it all out for our typesetter, not the easiest editing task I’ve ever undertaken, and he also sent me about 50 pictures to use in the book. It was worth the effort. The book was published to excellent reviews the following year, even though I never received the ‘official’ manuscript from VAAP (to whom, incidentally, we had paid an advance). We made arrangements for Artemy to visit the UK to promote it – the first time he’d visited the west – for which all sorts of official red tape had to be resolved. At one point the Russian authorities wanted to send a ‘minder’, presumably to make sure Artemy didn’t defect, but when we balked at paying the minder’s travel costs they let it drop. I was bemused by a seemingly obvious contradiction that the Soviets seemed to have overlooked: if VAAP hadn’t delivered a manuscript, how come Omnibus had published it, thus requiring its author to visit the UK promote it? Artemy's dedication to me at the front of his book. He told me once what it said but I have forgotten. Back In The USSR wasn’t a massive seller for Omnibus but it was translated into many non-English language editions and published in the USA by Faber & Faber. 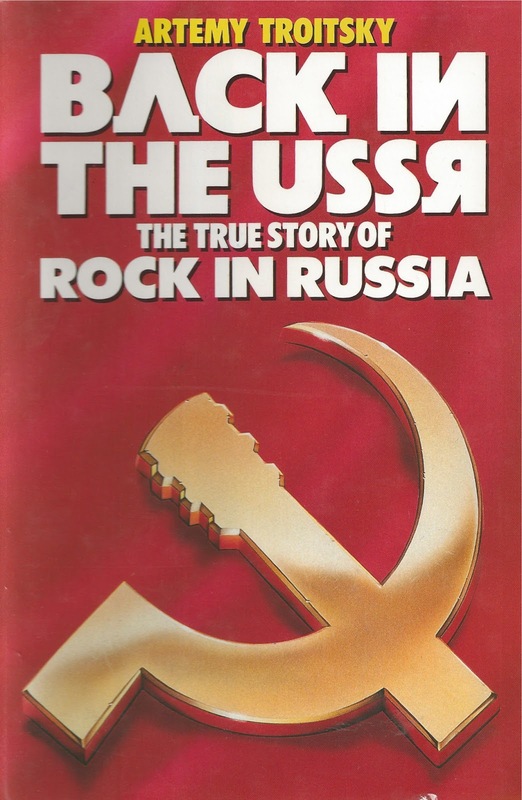 Like me, all these other publishers felt it was an important historical document, a history book if you like, and that the story of rock in Russia needed to be documented for future generations. In this regard Artemy did a wonderful job. On his visit to London Artemy appeared on TV and radio and, through my efforts, met up with Paul McCartney, Richard Branson and Brian Eno. He visited Bath, where he met Peter Gabriel, and Dublin, where he met U2. All of these famous names were keen to talk to him, to learn from his experience. That aside, I found the whole exercise deeply enlightening, not only learning about how rock permeated the Soviet Union against the wishes of the authorities – like everywhere else, like Canute and the tide, they simply couldn’t hold it back – but dealing with – and outwitting – official procedure. Finally, I’m happy to add that Artemy, who now lives in Estonia, has remained a great friend.